I often times struggle with lunch options during the week. I’m either uninspired or in a time crunch and just end up not eating at all. That’s one of the many reasons I love this Asian Chicken Salad. It fits the bill for a delicious and healthy lunch that I can make ahead of time and keep in the fridge for a few days. You can absolutely use boneless skinless chicken breasts that you poach or roast, but I prefer the ease of a rotisserie chicken chopped finely. The chicken meat gets mixed with a slew of delicious Asian flavors and then instead of pecans like in a traditional chicken salad this one has peanuts and grape tomatoes instead of grapes. Cute isn’t it? Do you have a favorite lunch box? If not I highly suggest looking into this Omie Bento Lunchbox. http://amzn.to/2DkrLiC It’s made for kids and I can see why, but why can’t adults use this too? The thermos keeps things hot or cold and you can pack this salad with lettuce for lettuce wraps, crackers for a carb fix, and fresh fruit and veggies. 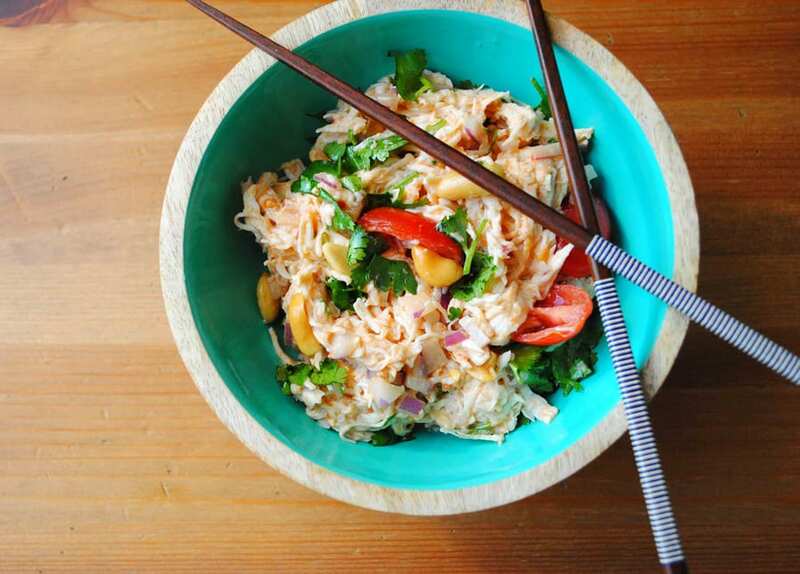 Whisk together the mayonnaise, chili garlic sauce, fish sauce, honey, lime juice, and peanut oil in a small bowl. 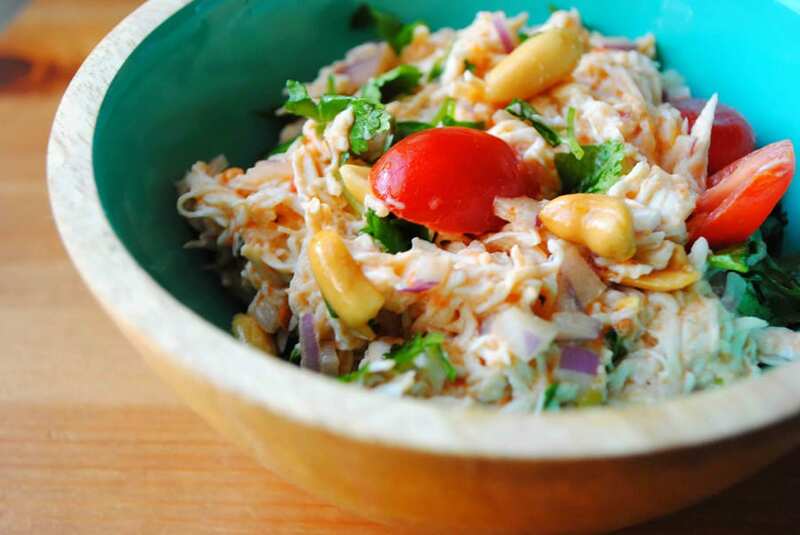 In a larger bowl add the chicken, cilantro, peanuts, red onion, and mayonnaise mixture. Toss to combine then gently stir in the tomato halves.